The long spell of fine autumn weather continues to coax the last drops of colour from the garden. Low sun at the start of the week oozes under the tree canopy like honey coating the fallen leaves with succulent gold. The end of the week was dominated by mists. On low ground and around the coast the mist was lifting by mid morning but in the garden it clung on through all of thursday and friday. Cornwall doesn't really have any mountains so I can't actually be on top of one, but at the end of the week it felt like the roof of the world. Warmth and a moist atmosphere have seen a resurgence of mealy bug in the greenhouse. A few have arrived on the Nerine and for the first time they have found the roots of some Primula so I will have to find time to discourage them later. The herbaceous border has degenerated into hay. It is a useful time of year to spot those things that continue to provide colour. 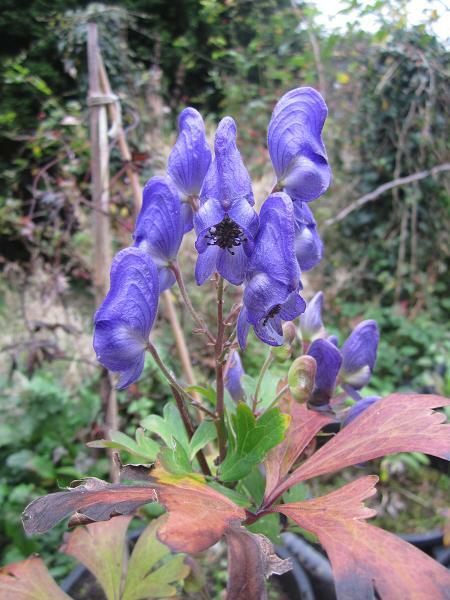 This Aconitum is producing purple flowers just when they are needed. In a shaded position last year the effect was a bit thin, but I have moved it into the sun and the dense heads of flowers are making more impact. From a collection by Crug Farm Plants at Ch'ollip'o in South Korea. Last weekend I mowed the Hellebore bed and congratulated myself on getting it done before the Colchicum appeared. I had every intention of giving it a second cut as soon as there was a spare hour. 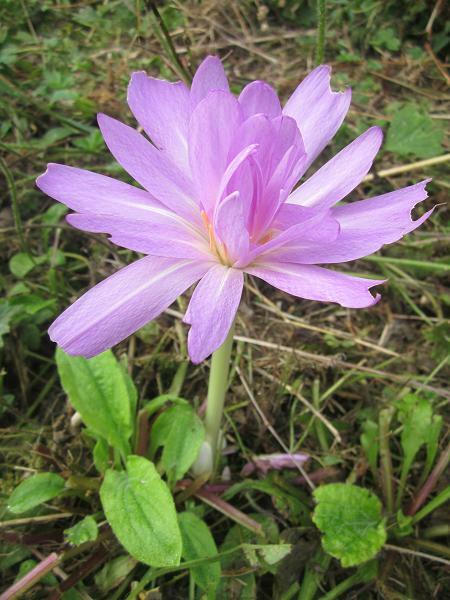 Yesterday I walked up there to rake off the mowings and found that the Colchicum had arrived. Fortunately C. 'Waterlily' is still quite expensive and I only have a handful, so on reflection I can still mow around them. When I looked at it yesterday I wasn't so sure and put the job off for a month. When the flowers die down there should be a few weeks before the Hellebores start to grow when I can cut it again. Bowles ('Handbook of Crocus and Colchicum' 1924, though I only have the 1955 Gardeners Book Club edition) reports that it was raised by Mr J. J. Kerbert of Messrs. Zocher and Co, Haarlem. He used the pollen of C. autumnale 'Alboplenum' on C. speciosum 'Album' sometime between 1900 and 1905 and produced 'Waterliliy'. As well at the double flowers of 'Alboplenum' it inherits something of the size of C. speciosum. On a still morning supported by rough grass it is magnificent, trembling with dew. One tiny puff of a breeze and it is over, crashing silently to the ground, too large for the fragile support. It continues as a thing of wonder lying on the groung like a stranded jellyfish. I want to cover the whole bed with them eventually, even though I know it will look quite awful. Awful and awesome (and brief). The Hedychium have enjoyed a long hot summer and a moderate autumn. They will continue to produce flower heads outside as long as the weather holds (or at least until November, when the stems will turn gold and fall). The evergreen species and cultivars in the greenhouse will struggle on until the cumulative effect of cold nights turns the last buds to mush, sometime between November and March depending on the weather. 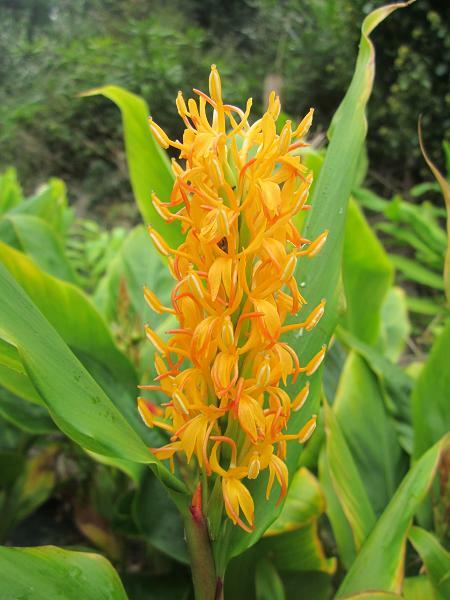 Hedychium densiflorum is one of the hardiest of species for outdoor use, surviving in much of the country and prospering in the south. The species grows all along the eastern Himalayas (India, Nepal, Bhutan and Eastern Tibet) and produces flowers in shades of yellow and pale orange. In recent years the market has been dominated by 'Assam Orange', a very hardy deep orange form collected by Frank Kingdon Ward at 6500 ft in Assam. The paler colours have been a little overlooked and so the late David Constantine selected and named two good yellow forms. 'Kalimpong Gold' has been the better plant with me. 'Kalimpong Yellow' is perhaps a shade paler but hasn't been as vigorous. Both plants are shorter than 'Assam Orange' and satisfyingly clumpier. The appearance of an occasional mealy bug among the Nerine has distracted me from the flowers. They got down into the bulb scales in spring while the leaves were growing and have been feeding on the bulbs through the summer, safe from insecticides. Now the plants are growing again I can get at them and hopefully get the plants clean before next spring. Nerine bowdenii has been the subjest of extensive breeding in the Netherlands to produce a range of colours throughout the season for the cut flower industry. They have concentrated on issues like flower number and shape rather than hardiness. The crop is grown under glass to protect the blooms and those with excessively twisted petals get tangled together and damaged in flower boxes so modern forms have simple, flattish flowers. A large number of new cultivars have appeared on the market in recent years. The bulbs we see offered in autumn are a by product of the cut flower trade and they are not always in the best condition (or correctly named). 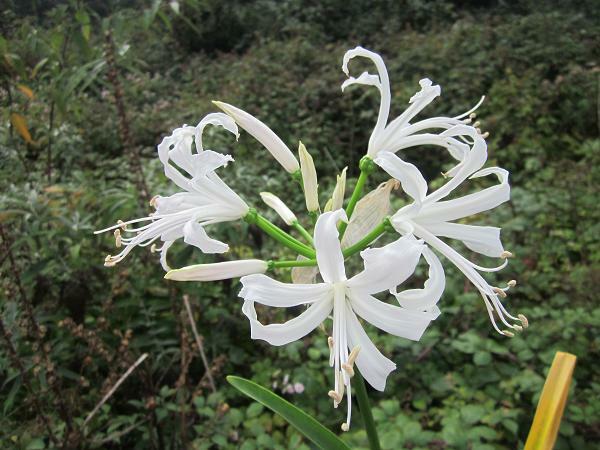 The Nerine and Amaryllid Society and others are trialling them at present and hopefully some clarity will result. 'Sophie' (other spellings are available) has grown well for me and produced pure white flowers a few weeks earlier than the very similar 'Ella K', assuming that names are real and more than just a marketing device.